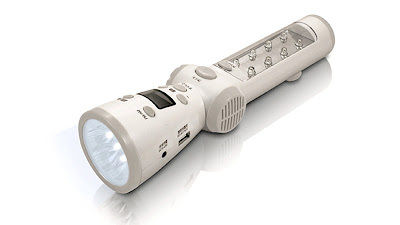 When a natural disaster strikes in the middle of the night, the last thing you want to do is waste time stumbling around in the dark looking for a flashlight. So a company in Japan, where recent disasters have left the country on high alert, has developed an LED flashlight that automatically lights up when an earthquake hits. The Gura-pika flashlight can be charged via a USB port, a conventional outlet, or a built-in hand crank, providing 14 hours of continuous illumination on a full battery. And it's also got a built-in radio tuned to emergency broadcasts and alerts which is how the flashlight knows when to automatically turn on. If for some reason the tremors shaking your home don't wake you, a loud audible alarm will certainly rouse you from your slumber. And to ensure an emergency broadcast is never missed, while the speakers and LEDs on the Gura-pika can be switched off, the radio is always on, constantly listening for alerts.